On August 8th, Arkansas Foodbank announced the public launch of its “Bridging Hope Capital Campaign”. The Campaign will fund the construction of a 22,000 sq ft packaging and processing center for volunteers at the Donald W. Reynolds Distribution Center in Little Rock. 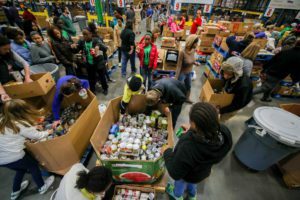 The $4.1 million campaign serves to leverage more food donations and dramatically increase the volunteers’ production hours. The packaging and processing center will not only engage more volunteers but also allow the Foodbank to accept larger numbers of fresh, nutritious, and perishable food. Such food donations are time sensitive – perishable – and require the Foodbank to have greater physical capacity. The new volunteer center will also allow two million more pounds of donated food to be accepted and processed annually. Each year, 450 local partners across 33 Arkansas counties depend on the work of the Foodbank. The reward of being able to feed more Arkansans is worth it. “More than 280,000 people a year benefit from the work of the Foodbank. 30 percent are children. 11 percent are seniors. The working poor need a bridge from time to time to overcome employment and health challenges,” says Sanders. One in six people in Arkansas may not know where their next meal is coming from. For children the number is even higher. 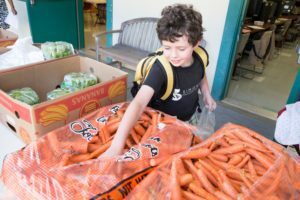 Last year, the organization distributed 26.5 million pounds of food to its local partners.